Buy $199 of Shun cutlery and receive a FREE $20 Gift Certificate on your NEXT purchase at MetroKitchen. Buy $299 of Shun cutlery and receive a FREE $30 Gift Certificate on your NEXT purchase at MetroKitchen. Buy $399 of Shun cutlery and receive a FREE $40 Gift Certificate on your NEXT purchase at MetroKitchen. Buy $499 of Shun cutlery and receive a FREE $50 Gift Certificate on your NEXT purchase at MetroKitchen. The Shun Classic 9 inch bread knifeis designed with a curved belly and ultra-sharp serrations so you can use it to quickly and smoothly slice through even the thickest artisan bread. The sharpness of this bread knife from Shun protects the soft interior of your favorite baked goods. It is long enough to slice even the biggest loaves of bread. A lifetime warranty from Shun, makes this Japanese-crafted knife a tremendous value. You'll appreciate how easily this Shun blade helps you to perfectly slice any loaf of bread thanks to its length and sharp serrated edge. The edge of this all-purpose knife stays sharper for longer thanks to its patented VG-MAX super stainless steel core. This high quality steel also makes it highly resistant to rust and staining. 34 layers of a patented blend of metals on top of the stainless core add strength and create the beautiful Damascus design on the blade. 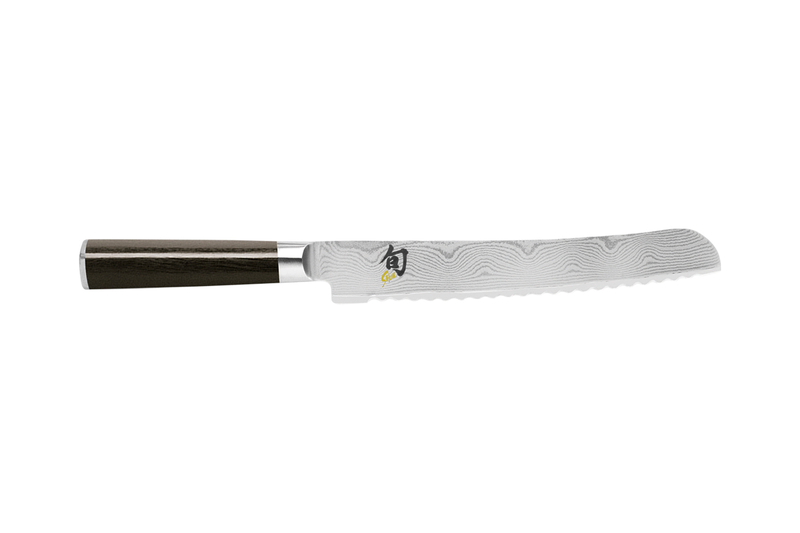 Limited lifetime warranty from Shun with normal use and proper care. Extra strong and durable because of an additional 34 layers of patented, SUS410 stainless steel are bonded to the rust-resistant core blade. These multiple layers also create the beautiful Damascus style design on the blade. Long lasting PakkaWood handle is crafted from resin and white birch, the hardest wood currently available. Shun knives meet very high standards for commercial use. They have an NSF approval. MetroKitchen.com recommends washing your knives by hand and immediately drying them. Do not let your knives soak in water. Avoid cleaners containing bleach or citrus extracts, as they may stain the surface of your knives. For longer lasting knives, cut on a wooden cutting board. Cutting on hard surfaces such as stone, metal or glass quickly dulls blades. To maintain a sharper cutting edge, use a sharpening steel, preferably each time after using your knives. It's best to store your Shun knife so the edge and your fingers are protected, preferably in a block or in-drawer knife tray. Shun knives don't need frequent sharpening because they are made from 32 extremely durable layers of stainless steel. Lifetime limited warranty from Shun with normal use and proper care. Free lifetime sharpening from Shun. Pay only for shipping; $5 for the first knife, $2 for each additional knife. Please print and complete this form and ship to Shun with the knives you'd like to have sharpened.